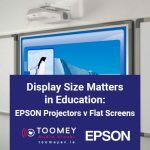 Toomey AV have been supplying language equipment into schools since 1968. We understand that portable language equipment needs to be robust and stand up to the challenges of day to day use and abuse. Audio quality is paramount, and all equipment must be fully serviceable year after year. BARTHE language equipment is lightweight and high quality. We offer a complete range of portable cd players, high powered CD players, battery PA systems and portable PA systems with CD decks and wireless microphones. 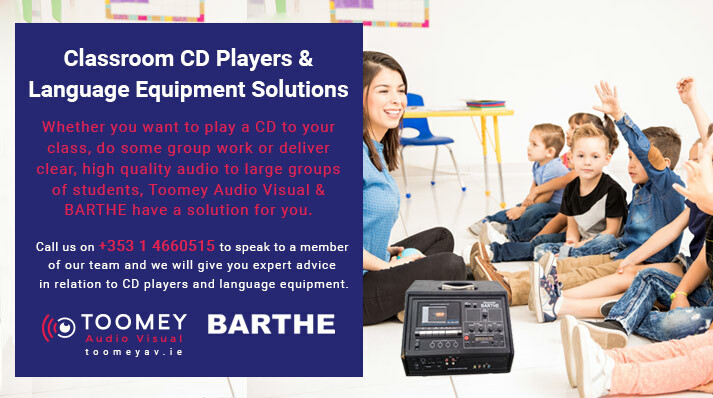 The Barthe AC range of CD players offer 7 watts of excellent audio quality in the classroom. The controls are easy to use and the speakers face students and provide excellent audio quality to Dept. specifications. All units have multi-headphone outputs for group work and optional USB playback and MP3 player plug in point. They are so portable and easy to use, each language dept. can have one. The powerful EDU Range is specially designed for language learning in larger groups with power ranges from 23 to 30 Watts rms. Ideal for large classrooms and small halls, this Barthe EDU range packs a punch and is perfect for use as a classroom CD player. Designed for learning languages in a class of 20 to 35 people, the speaker is built into a wooden cabinet and directed straight at the audience. It’s lightweight, easy to carry and robust. For larger halls and examination centres we have a range of high powered 80 watt and 120 watt PA systems with CD decks built in. These units offer wireless microphone and a range of input options as well as Bluetooth connectivity. The audio output is suitable for large spaces and multiple units can be linked together. This unit can also be mounted on a floor stand. 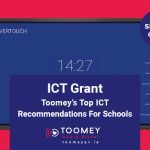 Whether you want to play a CD to your class, do some group work or deliver clear, high quality audio to large groups of students, Toomey Audio Visual & BARTHE have a solution for you. 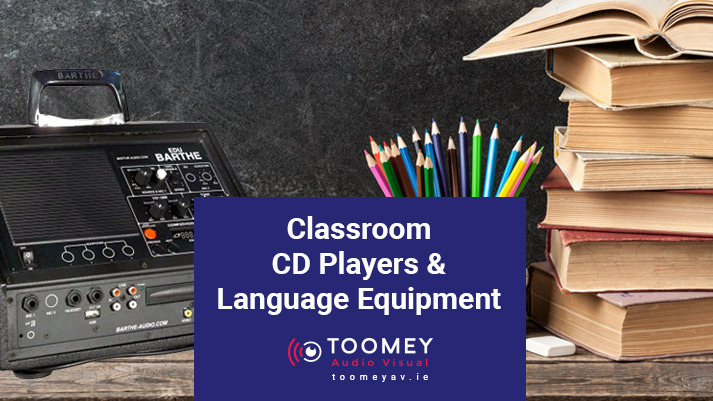 Call us on 01 4660515 or contact us online to speak to a member of our team and we will give you expert advice in relation to CD players and language equipment.